Starting with a survey of the sources of Islamic law, the book questions the capacity of Islamic law to develop and to adapt itself to the exigencies of time and place, since, although the rules of the holy Quran are eternal and immutable, yet they can well be interpreted to suit fresh situations. 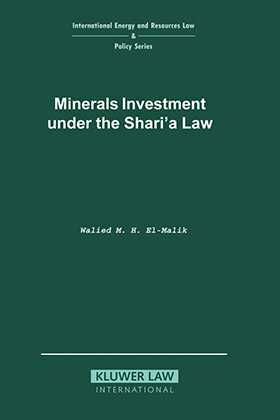 The author argues that, although private ownership of minerals is permissible under Islamic law, it is the consensus of the Muslim dilemma that state ownership of minerals is the best concept to be adopted by states in the public interest. He goes on to discuss state participation in mineral activities, types of agreements, methods of finance and how the shari'a laws fit into a well organized subject like the modern mineral industry. Finally, in regard to the protection of investors, Muslims and non-Muslims, under Islamic law, the author illustrates that investors are well protected and that no Muslim ruler has the right to deprive them of their property as long as they are performing their obligations. Unlike international law, under Islamic law public interest alone does not justify the taking of private property. Settlement of disputes and the attitude of shari'a towards modern international arbitration are examined. Foreword. Introduction. One: The Sources of Islamic Law. 1. The Holy Quran. 2. The Sunnah. 3. Ijma (Consensus of Opinion). 4. Qiyas. 5. The Secondary Sources. The Power of Legislation. Islamic Schools of Jurisprudence. Classification of Lands in Islamic Law. Two: Minerals Industry. Ownership Concept. Minerals Ownership. The Role of the Islamic State in Mineral Activities. Mineral Laws. The Grant of Mineral Rights. Mining Agreements. The Legal Nature of the Concession Agreements. Taxation under Islamic Law. Negotiations of Mineral Agreements. The Islamic Monetary System and Financial Institutions and Methods of Finance. Three: Guarantee against Arbitrary Breach of the Contract. The Principle of Non-Retroactivity of Laws. The Guarantee against Taking of Private Property. Settlement of Disputes. Selected Bibliography. Index.